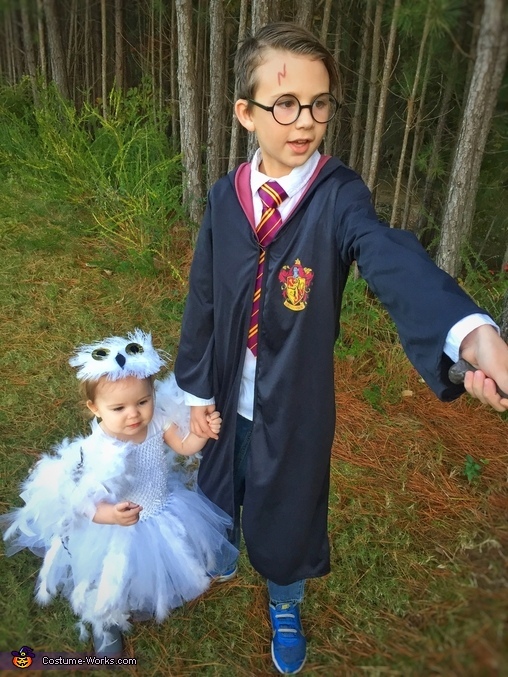 My son (age 9) wanted to be Harry Potter and have his sister (age 18 months) be his owl, Hedwig. I searched for a white owl costume but couldn't find one. I decided to make her one. I used white tulle and an 8 inch crochet elastic band to make the tutu dress. I then hot glued white feathers on the top layer of the tulle skirt. I attached elastic to make straps and then cut out white felt in 2 wing shaped. I attached the wings to each strap and then cut and hot glued a white feather boa to each side. I also glued in a handful of spotted dark feathers onto the wings to match Hedwig's. I also cut and hot glued the feather boa onto the bottom of some footless tights. I cut a piece of felt into an oval shape and glued large white feathers onto it. I used large gold sequins for the eyes and medium black sequins for the pupils. I cut a piece of black felt for the beak. I attached 2 alligator clips to make it like a hair bow (my daughter refuses to wear a headband but it could be made as a headband with ribbon or elastic band). To make the photos more fun, I added the special effects to make it look like my son was really casting spells with his wand.